Check out these cute gold bracelets. 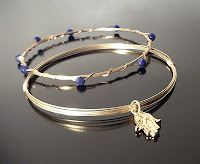 I especially love the way they look when layered with more gold bracelets. These are 14k gold filled and you pick the charm of your choice whether it be a hamsa hand (like the one in the picture) peace sign, sparrow or leaf.